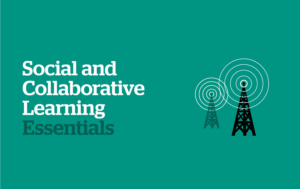 Are you interested in using social / collaborative learning strategies to create impactful, engaging, high-quality learning experiences? 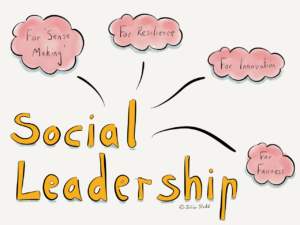 Join me in Sydney on 13 March 2017 to hone your skills designing and implementing social learning solutions. Pre-workshop – You can familiarise yourself with the program by viewing a small set of online resources. It is essential to select an appropriate workplace project to work on during the workshop – guidance is provided in a pre-workshop introduction to assist with this selection. Participants are also invited to join a private online discussion forum in LinkedIn. Workshop – This is a highly participative and collaborative event, focused around a number of individual and group activities. Participants will be able to work on the design of a social learning solution for your workplace project. You should bring your smartphone, tablet or laptop as we will be making good use of them to access web resources and use online tools. We will use a shared Google document for collaborative note-taking, and you are invited to use the LinkedIn group as a backchannel. Post-workshop – The LinkedIn group will remain active for at least four weeks after the workshop. You are encouraged to continue to work on your social learning solution, and you may seek feedback on your solution via the group. 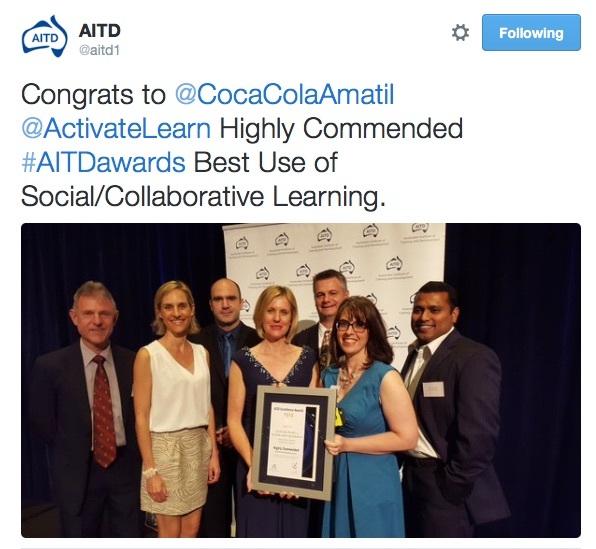 You also have the opportunity to participate in the collaborative development of a social learning resource. Additional resources will be posted and you can continue the conversation with the group online. The workshop is being run as a pre-conference event at the 9th Annual Blended Learning Conference. For more information on the workshop, about me as your facilitator, and how to register download the brochure. Use the hashtag #blc to follow the Blended Learning Conference backchannel. Add the hashtag #soclrn to follow the public backchannel for the workshop. I attended the Association for Talent Development International Conference and Exposition (ATDICE) in Denver 23– 25 May 2016. On the day after the conference I made a short video to share key insights I gained from some of the sessions I attended. Video is below, followed by (slightly polished-up) transcript. View my notes on Amy’s session. Another session I’ve got a lot out of for myself was on Stepping Into Thought leadership. The session was presented by two very dynamic people – Alexia Vernon and Halelly Azulay. Before they went into different thought leadership they talked about what thought leadership is. They suggested that you don’t need to carve out a completely original area of thinking or an original idea; rather it’s about bringing your original voice and perspective to the topic to articulate what you want to say about it. They provided questions to help you uncover your focus area of thought leadership. They also stressed the role of building strong networks to help build thought leadership. Their presentation was well laid out and I’ve captured key points in these notes. rising skills, which is about how to get back up after a fall. She really made me want to embrace life, to live a bigger life and to be the very best leader that I possibly can. I’m definitely a Brene Brown fan girl now. View my notes about this session. I went to the ATD Science of Learning Community of Practice panel. Four speakers each spoke about a different aspect science of learning. Paul Zak , Chief Research Officer at Olfactor, talked about trust as the basis for effective culture. He shared interesting research which uses oxytocin as a signalling mechanism for trust. 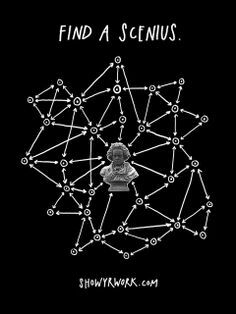 Sebastian Bailey is a psychologist with a PhD in learning transfer. He’s used his research to develop a model for supporting learning with bite-size methodology. He has founded Mind Gym. Patti Shank PhD and is president of Learning Peak challenged the use of the term ‘neuro-‘ anything. When someone claims that a product or approach is backed by neuroscience she suggested that you need to be wary as we haven’t learnt much about learning from neuroscience. However we have learned a lot from cognitive science and we should be paying bit more attention to that and applying it. Will Thalheimer is a PhD, consultant and research translator. He spoke about ways of improving smile sheets, which I’m sure anyone working in an organisational training context could benefit from looking at. View my notes on this session. The next area I was really interested in here was benchmarking and Data. I had a great conversation with Laura Overton of Towards Maturity who specialise in benchmarking and research on organisational learning. We discussed their benchmarking tool which is open at the moment. I strongly encourage workplace learning practitioners to complete the benchmark. I’ve recently done that and it’s giving me some good data to look at where my organisation sits compared to the benchmark in a range of elements of learning strategy and practices, and helped me to start identifying areas for improvement. Here’s a link to the benchmark . Laura also presented with Peter Casebow from Good Practice about improving how managers learn using an evidence-based approach. 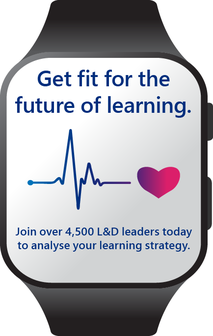 The Towards Maturity data shows that only 30% of learning professionals understand how their people learn. Good Practice has done research with 500 managers on how they deal with unfamiliar challenges. It turns out that access trumps the perceived effectiveness of method for finding answers and solutions. People will use the easiest way to access information, even if they know they may not be using the best quality information. Lack of access and lack of relevance of content were highlighted as barriers to people using their intranet to help solve problems. The final session I wanted to mention here is from the super-energetic Dan Steer who had us cheering along at the right times. It was on practical uses of social media in formal training. His objective was to ensure that everybody left with something practical that they could put into action immediately to improve the formal training – and he delivered. He provided some basic principles around only doing in the room what need to do, and thinking about using social media tools to do other things that don’t need to be done in the room. He also suggested you need to think about the type of activity you are doing, the objectives of the activity and identify the best motivating and most useful tool. One tool I learned about that session which I will definitely be looking to use is Ginkgo, which is a collaborative note-taking tool. What is awesome is that you can download the collaborative notes into a MS Word format and make that available as a readily accessible recap afterwards. View my session notes – or go straight to the source and view Dan’s materials and additional resources. 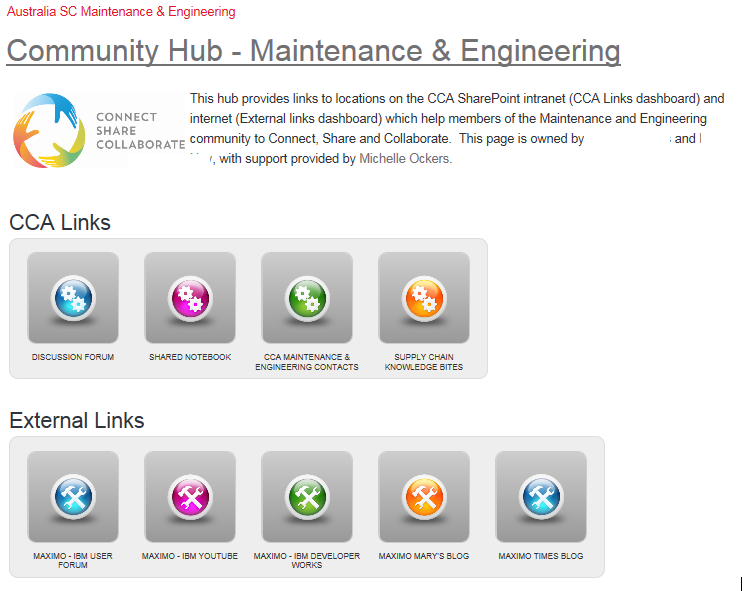 The Hub sits on our Maintenance Engineering SharePoint site, and is basically a dashboard with links to a range of spaces and resources on both SharePoint and the internet. In the video I walk through the spaces we’ve set up on SharePoint for Community members to interact online, connecting, sharing, solving problems and improving practices together. All of these spaces are accessible from any mobile device or computer using an organisational login. The mobile access is particularly important for maintenance tradespeople who spend most of their time in the production environment, away from desks. Discussion Forum – standard discussion board with ability to create new discussions, reply and like. The board can be sorted and filtered in a number of ways, and search is available on the site which will include discussions in results. A useful function I don’t discuss in the video is that an individual can quickly set up an alert to receive notifications of changes on the discussion forum via email (immediately, daily or weekly). This is helpful to stimulate those who aren’t working on SharePoint regularly to participate in forum activity. Shared Notebook – a Microsoft OneNote notebook set up on the Maintenance and Engineering site. OneNote is a very easy to use, flexible collaborative tool. We have set up a section for use during the Work Connect and Learn program, and there is currently another section being used for Maintenance Managers meetings. We expect to see use of OneNote increase as Community members become familiar with it. Contact Directory – a directory with expandable sections containing SharePoint profile key data. A person can be added to multiple sections reflecting the different groups to which they belong (e.g. Maintenance Managers, members of a physical site team, system Key Users). From each person’s directory entry you see whether they are online, start a Lync IM chat or call, create an email, access their contact details, or open their SharePoint personal page. Supply Chain Knowledge Bites – a separate SharePoint site where anyone can share a short ‘bite’ of knowledge or ‘how to’ information. Documents and multi-media files can be included in a Bite, along with links to internet resources. People are often unsure about where or how to share their expertise, so we’ve set up this space to provide a common way of sharing and accessing documented know-how. The second half of the video explores Knowledge Bites in more detail. Community members are learning how to use these spaces along with other collaborative tools (notably Microsoft Lync) through our Work Connect and Learn program. Program activities are being conducted in these normal working spaces so that people get used to using these spaces during the program, and continue to use them afterwards. Work on the hub commenced with a PowerPoint prototype which a colleague, Justine Jardine, developed with me in just one working day at the request of a keen senior manager who wanted to champion the solution at an annual planning meeting. We were able to respond so quickly in part because we had seen a demonstration of a knowledge sharing space set up on SharePoint 2013 by a New Zealand engineering firm, Tonkin & Taylor, in a 702010 Forum webinar. We included additional spaces and resources in the prototype, all of which we modelled on existing internal SharePoint sites. So, our prototype was low risk as we had working examples of all functionality included. While our internal IT department provisions SharePoint sites using a standard organisational template, they do not build any functionality on sites. They also do not allow custom development, which ended up precluding some of the prototype features as Tonkin & Taylor had done custom development. Further, we were unable to use SharePoint ‘Community features’ as IT is still trialling these. So, I developed the Hub using standard SharePoint 2013 functionality. While I knew how to build a dashboard, almost everything else I had to learn how to construct. I searched the internet for information and ‘how to’ articles and videos, with Helen Blunden (who was developing Work, Connect and Learn) researching SharePoint 2013 features alongside me. There is a LOT of freely available information about how to set things up in SharePoint 2013. I also got tips from our SharePoint SME in IT (he had time for quick questions), and appreciated some discussion with contacts at Tonkin & Taylor about their Knowledge Shots solution. Of course, the other way I learned was to experiment – to build things and see what they looked like, then adjust. Several members of our internal Capability Community tested and reviewed the build as Hub components were developed. Often their excellent suggestions could not be implemented with standard SharePoint 2013 functionality, but did push me to figure out different ways to do things as we continued iterative development. The experience of building this Hub has made me more resourceful as a self-directed learner, and more likely to figure things out for myself than wonder why IT hadn’t “trained me” on using SharePoint. At some point I’ll post an update about how Community members responded to the Hub and what adjustments or additional features we introduce. If you have any suggestions or feedback please leave a reply.